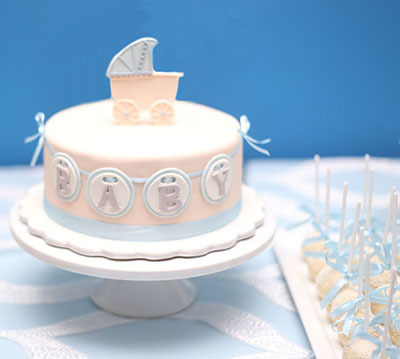 The baby shower cake picture gallery we have for you on this page is filled with photos sure to inspire your own creative ideas. There are photos of baby shower cakes for boys, girls as well as gender neutral cakes suitable for either or both. We also encourage professional as well as amateur bakers to use the form we have below to upload and share their designs with others. Please, feel free to include instructions for decorating the cake as well as the recipes that you used. Go here to see more cake pans and baby carriage decorations to use for your baking project. If you made your own decorations please include directions or a resource where our visitors might buy something similar will be very helpful along with contact information if you bought them locally or online. Example: Post a tutorial (instructions) for the project. Do you have a picture of the item that you made or your project to add? Great! Click the button and find it on your computer. Then select it. As food photographers know, lighting is as important if not more important than the camera you plan to use to take the picture. If possible, stage the cake near a window providing an abundance of indirect light or outdoors in indirect sunlight. Be aware that too much sun is as detrimental to a photo as too little and stage your shot in the edge of a shady spot to avoid glare. Shoot lots of baby shower cake pictures from a variety of angles and distances. Get plenty of closeups as well as pictures of the entire dessert table to include the decorations and other food items. The hostess' expertise in decorating a particular design or something as simple as the guest of honor's preference of chocolate over vanilla. There can be any number of factors that determine the choice of a particular style of cake. The goal of Unique Baby Gear Ideas' baby shower cake photo gallery is to show you what other professional party and event planners are doing not because what they create is "better" but to make your job easier. Duplicating their food and dessert choices (that are often accompanied with recipes, detailed instructions and decorating tips) will make planning so much easier!